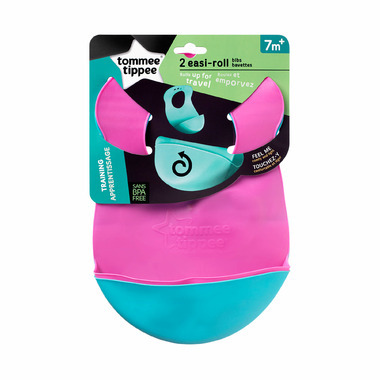 Tommee Tippee's award-winning bib wipes clean when things really get messy. The innovative and convenient crumb-catcher collects the mess while a dimpled reverse backing encourages air flow and prevents irritation of delicate skin. These are ok. I find the material a little stiff and doesn't bounce back to its original shape (after being rolled up) quite as nicely as other silicone bibs. Good function for the price though. Love these bibs. Great price, super easy to clean!